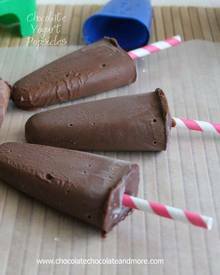 Rich Chocolate Combines With Low Fat Yogurt For A Cool Treat! Rich Chocolate flavor, but healthy. You don’t even know these are made with yogurt. Now if you have kids, they won’t like the dark chocolate unless you add some extra sugar. At least mine didn’t but they loved them with semi-sweet chips. And using milk chocolate chips is amazing!